Mexican Cartoon Characters Set that includes a Mexican Girl, a Mexican Man, and 10 Mexico items. Our Mexican girl is dressed in a traditional Mexican dress and holds maracas. The Mexican man has a classic Mexican hat and holds a guitar. These two characters are coming with a great collection of 10 Mexican items. You can scale them as you need – you won’t lose quality if use them in high resolution or print designs. You can change colors with one click – you just need to select the filling color and change it to fit your needs. You can modify the shapes easily – vector shapes can be easily modified. For example, you can change the cactus’s width to make it wider, and won’t experience any issues as you would with the raster-based graphics. 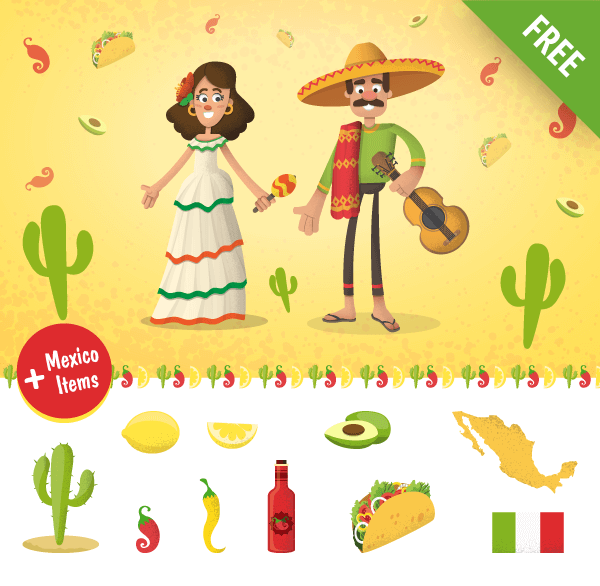 You can download our Mexican Cartoon Characters Set + Mexican items FOR FREE. Just click on the download button below.